A poignant tale of true love is being told through a Skelmersdale care home to commemorate Remembrance Day. For the third year, The Lovers have returned to the reception area of Birch Green Care Home, as residents and staff continue to follow their story in the next chapter of their lives. This year they are sending congratulations to the pair who appeared with a babe-in-arms with the little one’s dress starting off the sea of poppies. 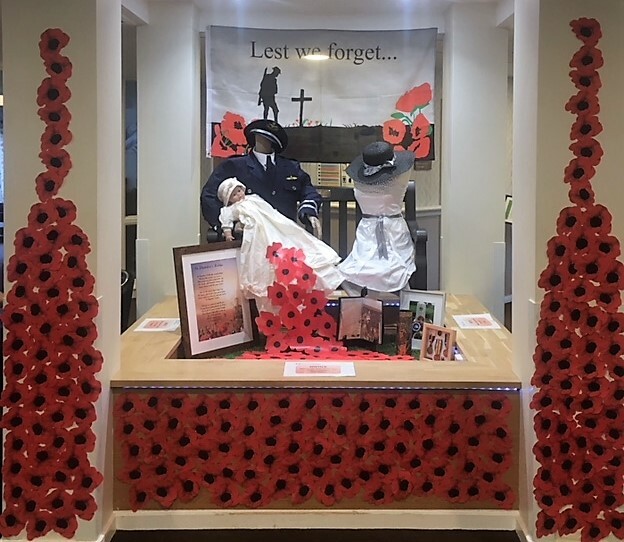 With almost 1,000 poppies to be seen in the care home reception display staff said that they are proud to show off the residents’ efforts who all got involved in creating them. The love story started back in 2016 with two mannequins used to represent wartime lovers. Back then The Lovers sat on the bench with a sea of poppies falling from the soldier’s uniform. Last year, after he had returned maimed from the war, it was the couple’s wedding day with the bride’s dress starting off the flow of poppies. Gill added: “The display means so much to them because it’s so close to everybody’s heart – residents put their heart and soul into it and can spend hours making the poppies. This year the home also has additional items to view with precious memorabilia from the First World War on display.